A video from the development of the game was reported to have been shown at the New York CDi 3 conference in October 1993 and at the 1994 Winter CES, according to Interactive Dreams, but unfortunately, this footage is still missing. We know from the cancelled Mario’s Wacky Worlds that unfinished CDI games are not particularly that great to look at or play, but we hope to be able to see some screenshots and footage from Mario Takes America one day. Super Mario in the USA? In the beginning, a key part of the initially outlined concept of Mario Takes America involved levels made up of real life photography, overlaid by 2D sprites to illustrate characters. Describing the game’s intended visual style, one of the artist who worked it likened to the movie, “Who Framed Roger Rabbit?“. The photos and videos that made up the title’s locales were filmed on location and Cigam travelled all around the US to capture them. Camera setup and speedboat used to film the background places. These were Louisiana film people hired for the shoot day. The Niagara Falls Sequence – a Second Bell Jet Ranger arrives. They elected to use a helicopter with skids above the falls as they did not want to float over the edge if they landed on the water. Below the falls (Mario in a barrel) Rapids sequence Helicopter with floats takes off. They were shut down after 2 trips down the rapids because they flew under the cable car. “Software company CIGAM has had to shoot original footage on location for much of the title, including scenes where Super Mario flies over the Manhattan skyline, falls over a waterfall and skims across a lake by boat. The film crew used a helicopter to shoot some of the more tricky sequences, and it is believed this will be the first CDi game to use such dramatic footage. 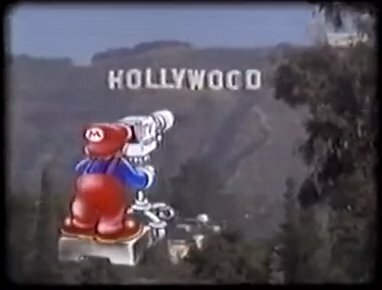 The storyline involves Super Mario arriving in New York, traveling across the US and eventually arriving in Hollywood where he stars in his own interactive film. He travels by truck, train, car, aeroplane, helicopter and even a motorbike! Thanks to Matt for the second scan from CD-i World Magazine! All of these were coded and playable, but as the Philips CD-I was not enough powerful, the team had to degrade a lot of the animation to get the collision detection to work. The team behind Mario Takes America, Cigam Entertainment and their Cinevillage office, was founded by a Canadian investor named Howard Greenspan, who sadly died some years ago. It seems that there were only a couple of developers at Cigam and the very first programmer who was hired quit the job after only 3 weeks, after reading the CDI’s tech specs. He said: “Our whole foundation is built on sand“. Once the team had captured the materials for its backgrounds and eventually began importing them into the game, disaster struck. Due to the CD-I’s restrictive hardware capabilities, once the team had programmed the backdrops into the stages, they had very little memory left to add in their planned Mario sprites. The result was a technical nightmare for its programmers. What happened to Mario Takes America? The project was too ambitious and the CDI was a huge failure. Even Philips, who were once interested in the game, saw that Cigam was unable to fulfill the original concept and decided to cut their funds. Cigam had to stop their work on Mario Takes America, but Howard was still hopeful to find another publisher with new funds and rework the game under a new identity. At one stage, the producer even attempted to form a partnership with SEGA to replace Nintendo’s mascot with Sonic The Hedgehog. However, this never went forward as his attempts to contact them about it went ignored. He then asked the art department to replace all the Mario sprites with a new character of their own creation, called “Metal“. As crazy as it sounds, even with this change, the project was doomed. Soon, Cigam Entertainment closed for bankruptcy, and the Canadian Imperial Bank of Commerce proceeded to mortgage all of the company’s assets. “In November of 1994, Cigam relied on those new policies to obtain a line of credit from CIBC to finance its operations. However, during the past summer, CIBC managed to mishandle the account and the claims and policies made previously no longer applied. As a consequence, the bank demanded additional security — a collateral mortgage on Mr. Greenspan’s personal property. Cigam’s banking arrangements deteriorated rapidly, causing immediate negative affects to the operations of the company. Amazingly, it appears that the Canadian Imperial Bank of Commerce reposessed all of the game’s assets from Cigam, which goes a big way to explaining why so little information and media of this game was ever recovered. It is still very possible that the Mario Takes America assets could still be lost somewhere in the CIBC archives. Maybe one day, some nice CIBC employee will rediscover them and decide to share this piece of gaming history with the world, but until then, we’ll still have to dream about this hugely obscure Mario game that was never released for the CDI. Last updated by monokoma at 29-01-2015 . I hope we will one day get the cutscenes of the game. we might be able to make even more ytp! Very interesting and though it’s unfortunate because of that bank we will never be able to see the main prototype parts of the game, I think it’s probably better that this game didn’t get made so mario could keep adventuring in his own crazy and cool world. Thanks for bringing this to light. Disappointing for sure! But if you have every played a game on the CD-i this is only a good thing. The controller that came with the CD-i 220 Series was awful. Imagen sacada de The Lost Media Wiki.